I Would Challenge You To A Battle Of Wits But I See You Are Unarmed - Journal/Notebook now available on Amazon. 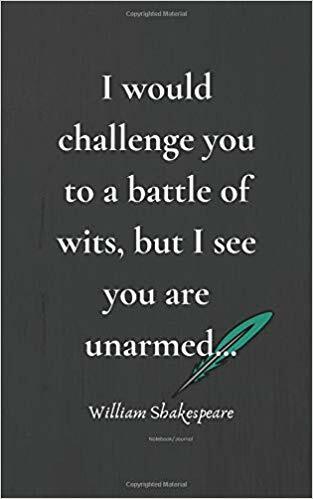 CALIFONIA, Colo. - Jan. 20, 2019 - PRLog -- A journal/notebook called "I Would Challenge You To A Battle Of Wits But I See You Are Unarmed" is available to enjoy in all Amazon stores. About the quote "I Would Challenge You To A Battle Of Wits But I See You Are Unarmed"
This is such an interesting and a funny quotation. More one thinks about it the more people love it. What is this quote trying to tell us? Who is the quote directed at? Who wrote it and why? There is a lot of confusion about this quote. Many have attributed this quote to William Shakespeare from the play Taming of the Shrew originally published 1623. Some have even attributed this quote to Mark Twain, Oscar Wilde, and Winston Churchill. But so far there is no evidence of this. "The blood swung its reddest pennant out over the boy's cheeks, but Trissilian's mood was not to be resented, or resisted. A battle of wits was to be fought, and the Boy in Blue was unarmed to-night." Nonetheless so far many have accepted that it was written by William Shakespeare but it may not have appeared in a play. A meaningful William Shakespeare cover for all those who enjoy English Literature, students, teachers and all those loves to read.